This week, my short story "The Shadow of the River" was published in Fish Tales: The Guppy Anthology. "The Shadow of the River" is the first short story I've had published, and the second short story I've written. Though it sounds counterintuitive, I used to think that writing a short story would be more difficult than writing a novel. Whenever I began to write a story, the idea would get away from me and grow into a plot that needed to become a whole novel. I didn't know what I was doing wrong. I understood the idea that a short story needed to be grounded in a twist, but I wasn't able to put that idea into practice -- until I realized that my favorite short stories are locked room mysteries. Locked room mysteries are those puzzles involving seemingly impossible crimes -- a dead body in a room locked from the inside with no way for the murderer to have escaped. Edgar Allan Poe's "Murder in the Rue Morgue" is an early example of the genre. John Dickson Carr, one of my favorite authors, wrote dozens of locked room mysteries. The resolution of these mysteries is when the detective shows how the seemingly-impossible crime was carried out. That revelation of making the impossible possible is the twist. If it's a good story, it'll leave you slapping your forehead saying "Of course! Why didn't I see that!?". When the Fish Tales anthology was open to submissions, I sat down to write my second locked room mystery -- this time, without a gargoyle. I began with Jaya Jones, the historian protagonist of my mystery series. I put her back in time in graduate school to solve the locked room murder of one of the professors in her department. The story became "The Shadow of the River" and was accepted into the anthology. The Fish Tales anthology is a project of the Guppies chapter of Sisters in Crime. Since we're "guppies," the broad theme of the anthology is bodies of water. And since Jaya is a historian, the body of water in my story is a historic map of rivers that converge in India. How does this ancient map lead to a locked room murder? Jaya Jones solves the baffling crime. 22 tales of murder and mayhem by the rising stars of mystery. 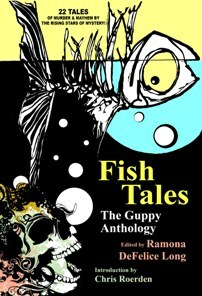 Fish Tales, The Guppy Anthology, casts a wide net across the mystery genre, delivering thrills, chills, and gills. This water-themed collection features locked room puzzles, police procedurals, cozy characters and hardboiled detectives... Come on in, the water’s fine. But be careful or you might find yourself sleeping with the fishes! It's fun to see it in print! Did you design the cover? I think it's great!!! And I agree with M, the cover is totally fun. Congrats!! I love hearing about your process in writing the one kind of short story i've never tried (and doubt I have the chops for) - i too can't wait to read it! well done, gigi, herder of gargoyles!! Ohh, locked rooms mysteries always make me think of Jonathan Creek...and I love me some Jonathan Creek. I can't wait to get my first glimpse of Jaya Jones. I've heard so much about her. So exciting! I should also mention (for ebook readers like Rachael) the anthology is available as an ebook on Kindle. As a fellow author in the anthology, it's interesting to see how your story came about. Nice, promo, Gigi. Keep it up. My story is last and about a group I'd like to turn into a book. Someday. 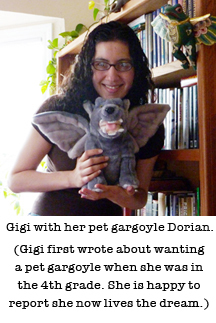 Gigi, I love your stuffed gargoyles! As someone who's read your gargoyle story, I think it would easily find a venue. Paranormal/supernatural stuff is so big right now. And my short story experience matches yours. With the exception of the story I have in the Guppy anthology and a Christmas story I wrote around the same time, all my short story ideas turn into plots for novels as well. But, like Sophie, I don't think I have the "chops" for locked-room mysteries either. Thanks for promoting our anthology! Gigi, how interesting to learn that the locked room story is how you got a handle on the short story genre. When I was writing my Fish Tales story, I kept making the plot too complicated until I settled on my two major ideas. Then it clicked. It's fun reading how different writers come up with ideas - especially when there's a theme involved. A locked room mystery sounds fun - and like it would be hard to write. I can't wait to read all our stories when I get the paperback version in my hands. My copy of Fish Tales is on order and I'm waiting for it eagerly. This post certainly adds to my anticipation. Martha, you're in for a treat with Jonathan Creek. That's fabulous. Well done you and it sounds like a brilliant read. Congratulations. Well done, Gigi -- and congratulations on your excellent presence on the panel at LCC last week! You're a natural! This is great, Gigi! We need to get some copies of Fish Tails for raffle prizes, as well as possibly have them for sale at the meetings! Gigi, I love hearing how all our stories came into being. I've said it before, but it bears repeating...I am so honored to be included with such a great group of writers in this anthology. Bravo. I love locked room mysteries, and you have done it with aplomb! I'm so excited for you, Gigi! Congratulations on finding a way to figure out how to write short stories. I'm sure this is just the beginning of a great publishing career. Congratulations, Gigi! Can't wait to read your story. I started out writing short stories, but after switching to novels, I can't seem to get my head around shorts anymore. The ideas just keep growing larger. Wonderful that you can do both! Hee!! Another Jaya story. Can't wait to read this one. It's on my Kindle, ready to go. Yay!!! Gigi, I can't wait to read "The Shadow of a River" and all of the other stories in the anthology. I love locked room mysteries but really want to know more about that gargoyle story. Thanks for sharing your journey with us.